Stop hostile skiffs with a zap. Down enemy drones, too. These are some of the selling points of a new shipboard solid-state laser. 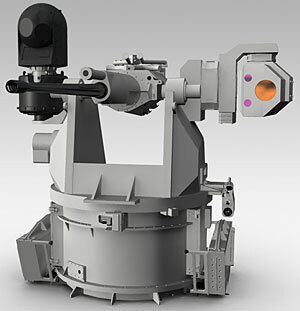 Boeing and BAE Systems received a $2.8 million contract to test the 10-kilowatt commercial laser installed onto the 25mm gun mount, which is used aboard ship, in 2012. After decades of development, lasers have come far enough that a shipboard laser could enhance a warship’s self-defense, designers say. 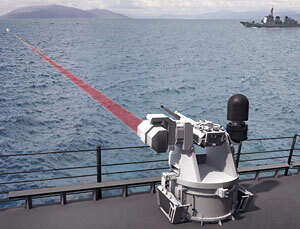 “If approached by a small boat with unclear intentions, a ship with Mk 38 [Tactical Laser System] could stop it with nonlethal means, such as frying the engine,” Amir Chaboki, a manager with BAE Systems, was quoted as saying in a Boeing press release. Chaboki added that the laser is more accurate than guns. But gunner’s mates out there: Don’t get too amped up yet. Even if the system works and the Navy buys it, sailors aren’t likely to man the tactical laser topside, leaning into the harness like the 25mm and turning the mount with their body weight. The design drawings lack the harness altogether, suggesting the laser is more likely to be fired remotely.